Here are some recent reviews from couples I’ve served. To see more reviews, please click The Knot and Wedding Wire. How do I even begin to put in to words how instrumental Renee was in my wedding day being absolute perfection?!? I don’t think it’s possible, but here goes my best attempt. My now husband and myself fell in love with Renee as soon as we came across her website. The variety she offered, and that magic wand, made me SO excited for the possibilities for our ceremony. Renee quickly set us up with a phone consultation. During that two-hour conversation (sorry that I ramble when I’m both excited and nervous, Renee! 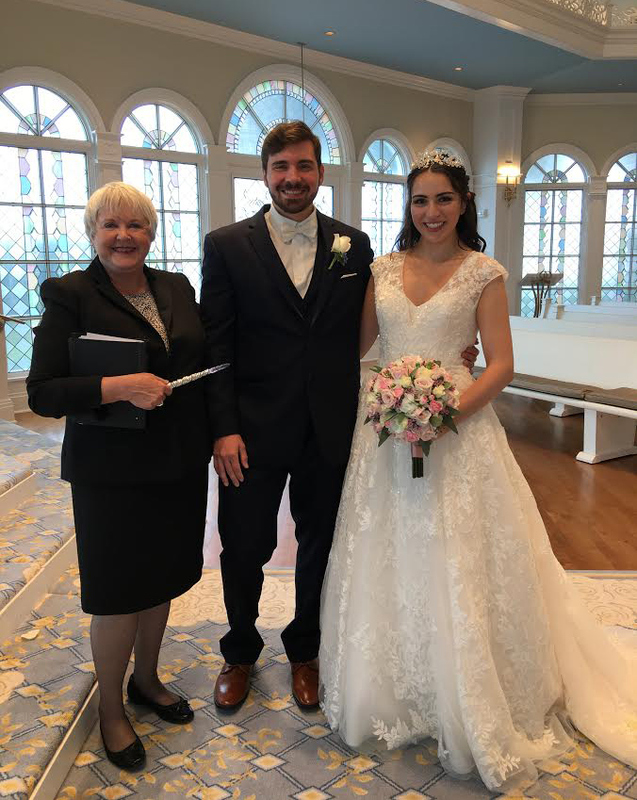 ), it became evident to my fiancé and I that Renee would be far more than a trusted officiant for us — she quickly became a trusted friend in our planning process. She had genuine excitement when discussing our day — something our own families often lacked. We wanted a unique ceremony, one that tied us together not just with each other but with our little one as well. Prior to the phone consultation, I had been burning my fingertips off frantically scrolling Pinterest for ideas. Renee put an abrupt stop to that stress. She assured me she would handle all of the research and idea creations. I put my faith in her and stopped stressing about it. She also provided us honest, useful recommendations for other vendors we were struggling to choose and walked us through the process to obtain our marriage license. She made wedding planning fun, something else everyone before her had failed to do for me. With her guidance, we obtained our marriage license and had it mailed to her (so awesome not having to stress about remembering it on the busy wedding morning). Renee was at our venue early when I arrived. She gave me the best hug I ever received, like a long-lost friend I hadn’t seen in ages, and spoke with me — calming all of my jitters. She helped coordinate the ceremony with our Disney planner and photography team. As I prepared to walk down the aisle, she re-appeared to tell me a little story about how I was marrying the right man — while I was sure of that long before it was time to walk down the aisle, to have someone stop me right before the big moment and remind me what it was all about to begin with meant the world to me. She delivered a FLAWLESS ceremony — one that brought my little family together officially. It was so beautiful. Just re-living it in my memory brings a fond tear to my eye. Ending the ceremony with the wand was such a magical surprise for all of our unsuspecting guests (highly recommend it)! 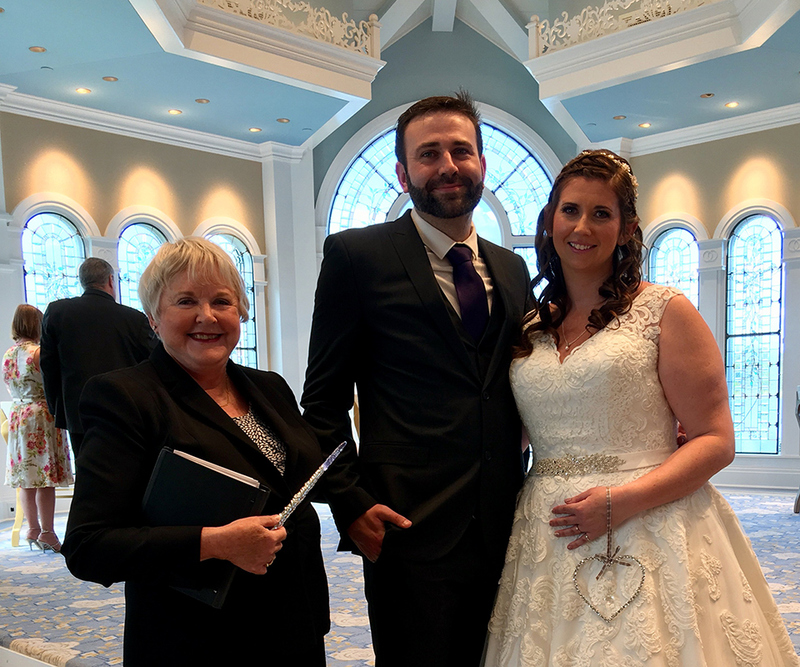 If you are in need of an officiant for your special day, book Renee today before the next lucky bride gets her — you will not be disappointed!!! GRATEFUL is the first word which comes to mind when thinking of what to write about our experience with Renee. I am so grateful for EVERYTHING Renee contributed to our wedding. From the very first phone call, I truly felt as though it was destiny I was put in contact with her. The time and effort Renee gives to making sure the ceremony is exactly what you envision is unprecedented. Whatever anxiety we may have had at rehearsal about the wedding was put to rest that evening in large part because of Renee; her directions and tips for the ceremony made all the difference in the world. 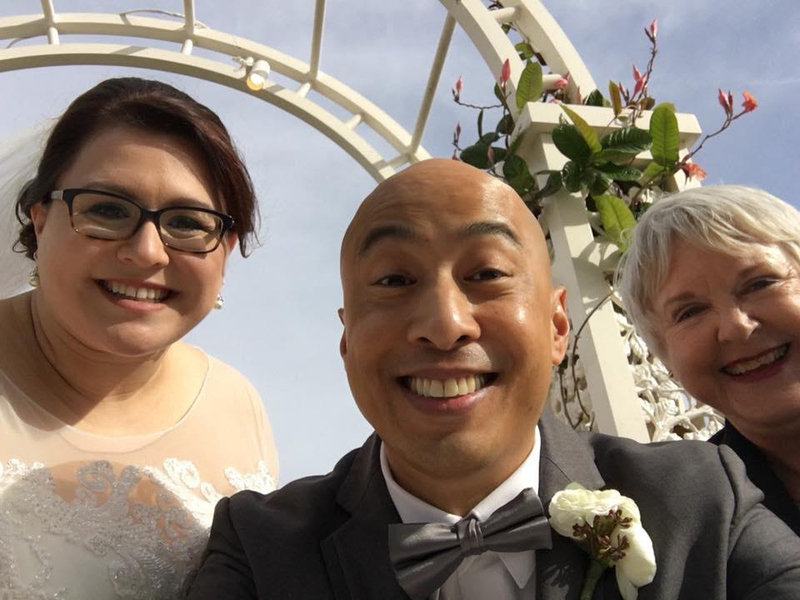 The actual ceremony was perfect — it felt as though a family friend who has known my husband and I our entire lives was marrying us. Everyone who attended the wedding was wildly impressed with how personal and natural feeling the ceremony was. I just cannot imagine the day and Renee not being a part of it — my husband and I feel so thankful our memories of that day include her! We WHOLEHEARTEDLY recommend Renee — you will not be disappointed. Oh, wow. 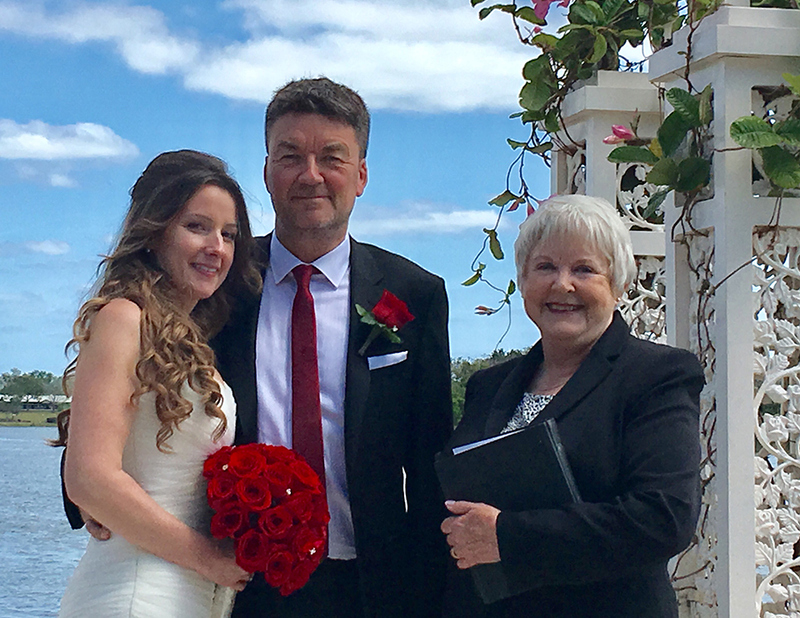 Hiring Renee at A Lovely Ceremony was one of the best decisions my husband and I have ever made. We had a shared vision on what a perfect ceremony was, but it was definitely one that was nontraditional– and the hardest thing about being nontraditional is that there aren’t a lot of references out there to go off of! And when you’re planning a wedding, getting a ceremony down to the “T” can seem nearly impossible. The best way to describe Renee is she’s an expert at her craft. I really never knew an officiant could be so good. When I first got ahold of her by phone, it was a relatively short period before the wedding. I left her a voicemail and that same day she got back to me. We spoke for over an hour! She just wanted to get a feel for what kind of couple we were, our passions, our likes and interests… She was easy to meet up with, and she gave us examples from what I imagine must be a huge arsenal of all the wedding ceremonies she’s written. She had a plan for each part of the ceremony and helped us make it perfect. Day of, Renee had a bit of a scratchy throat but it didn’t stop her at all. Seriously, no one had any idea, she’s an amazing orator! She spoke perfectly: the right pauses, the right pace, all of it. She gave us lots of great advice for a more intimate ceremony. I had a funny couple of moments where one eyelash (!!) then the second (!!!!!) came off my makeup as I teared up, ohhhh my goooosh…. *boom,* there’s a handkerchief from Renee. She, my husband and I all got to laugh to ourselves at such a funny moment, but nobody else in the crowd even noticed. She didn’t skip a beat, and honestly, all of them were in tears anyways. *Happy* tears, obviously. It was THAT good. Hire Renee! You cannot go wrong with her. She will make your ceremony perfect. We were referred to Renee from friends of ours who had their wedding ceremony performed by her. After contacting Renee by email, she immediately scheduled a video call so we could get to know each other. A few moments into the video call, my now-wife and I had an instant rapport with her, and immediately made the decision to have her to perform our ceremony. 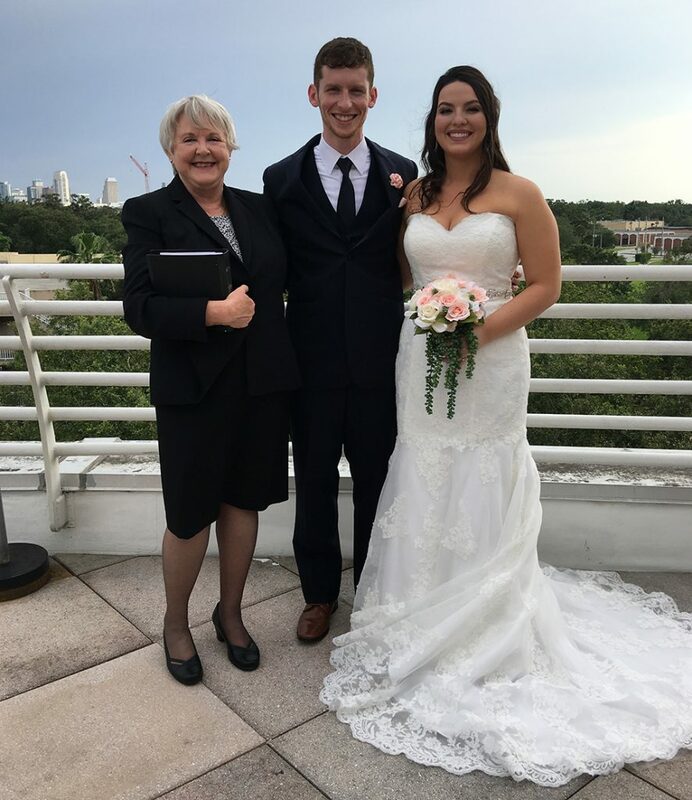 Not only did she work with us to provide us with a ceremony that would be both elegant as well as comedic, but she was able to assist in a number of facets that we, as Non-Florida residents, were uncertain about. For instance, Renee was knowledgeable about the marriage license application process and timeline which allowed us to easily complete it from hundreds of miles away. Due to circumstance, our rehearsal was held in a ballroom and our wedding was slated for a different venue. Renee was knowledgeable of the details of our Disney venue and was able to inform us on where certain markers would be. As a result we were able to visualize where we would stand, where to walk, and how to face. This made the actual ceremony comfortable and minimized the amount of faux pas on our part. Because of this, the ceremony went exceedingly well. Renee has a wonderful sense of humor that complemented our somewhat goofy personalities but is very professional to ensure the integrity of the ceremony. 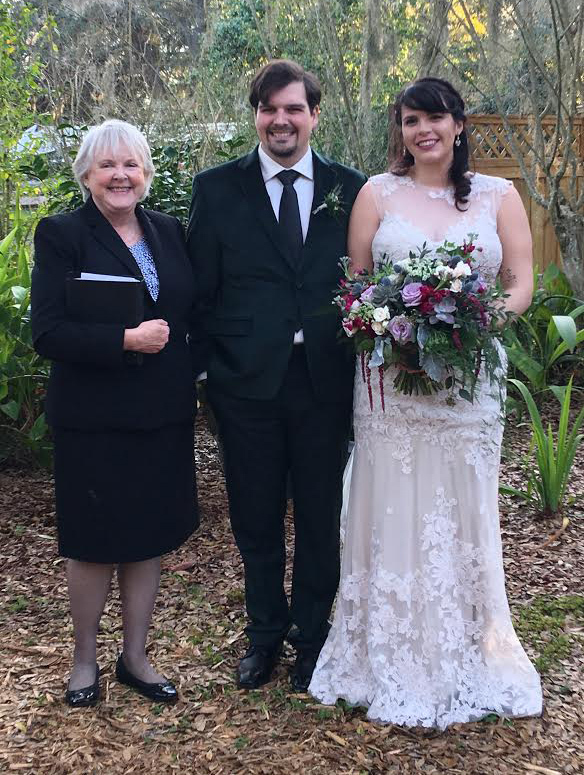 She is extremely personable and she was invested in our ceremony to ensure that it was as magical as we could have imagined. 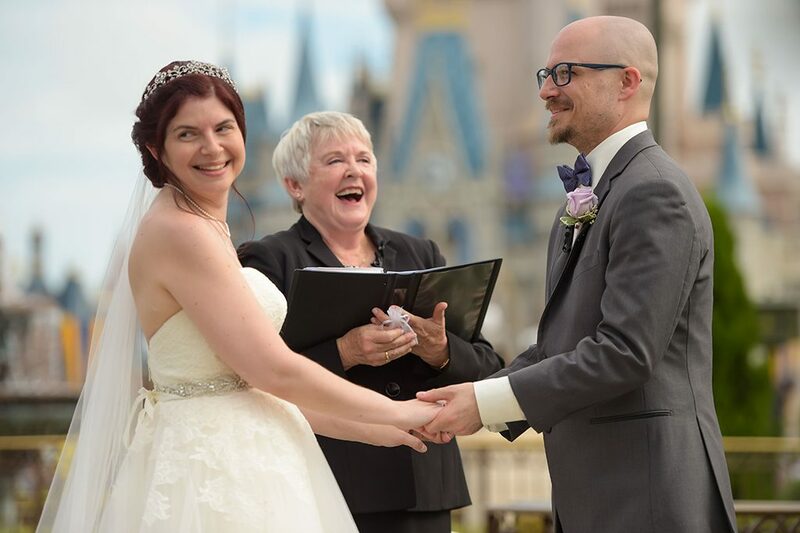 My husband and I chose to have a Disney World wedding mainly because we were looking to have a magical day at our favorite place. I can honestly say Renee, and our ceremony, was the BEST, most magical part of our day. Renee was incredibly helpful with assisting us in preparing our vows and really took the time to get to know us as a couple. She was so, so creative in adding fun aspects to our ceremony, while perfectly capturing my husband’s and my love story. 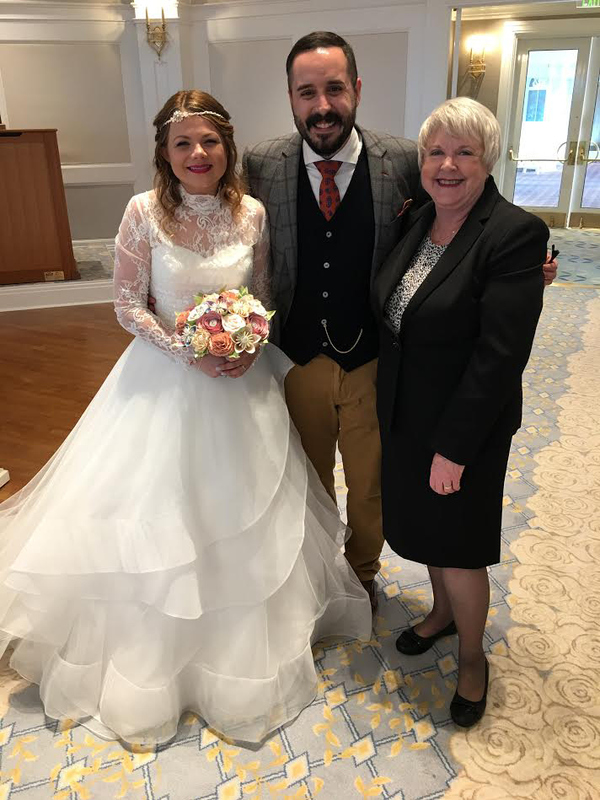 She treated me as if we were lifelong friends on my wedding day, and the lovely chat she had with me before walking down the aisle really helped to calm any nerves. Renee goes above and beyond to help make it a perfect day. Not only was she amazing with vow writing, but her timeliness in responding to emails and her helpfulness with information on name changes and obtaining the marriage certificate was outstanding. My husband and I will most definitely book Renee for vow renewals in the future!! Renee was practically the easiest wedding decision we made, and she was just as wonderful as we had imagined. 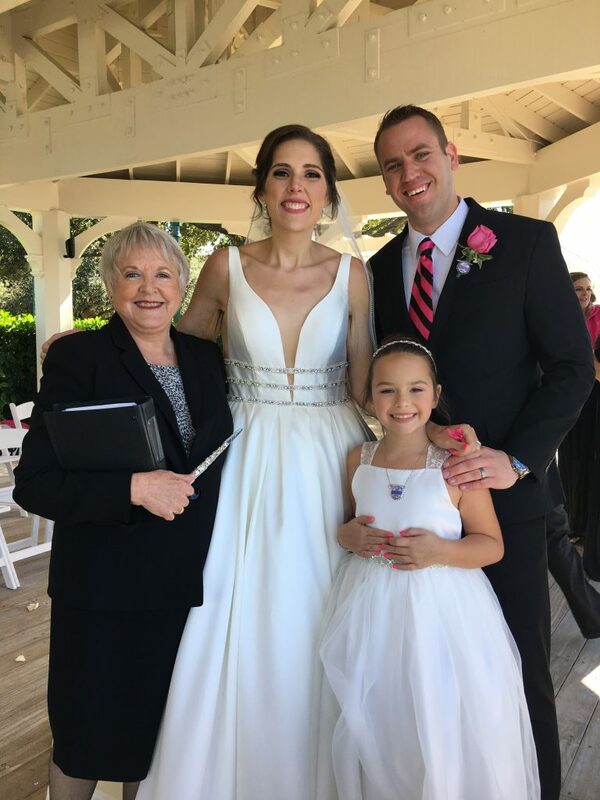 She is incredibly responsive with e-mails and made it easy to set up time to meet (via Skype since we are from Texas) when we first introduced ourselves and again when we were finalizing our ceremony and needed a little extra help and re-assurance. We had decided to write our own vows and Renee was a tremendous help for both of us when it came time to put our thoughts into words, helping us edit/revise the vows and making sure the tone matched (we kept our vows secret from each other until the big day.) At the rehearsal and on the big day, she was a very calming and sweet presence and you truly feel that wedding ceremonies are a passion for her. She will give you lots of great tips throughout the process — we could not have chosen someone better. Hiring Renee was such a wonderful decision. The time and effort she puts into creating your ceremony for you is unmatched. She truly tailors your ceremony to fit you as a couple — and it’s amazing. She prints your vows on a card (if you’re writing your own) and has them ready for you so it’s one less thing for you to worry about, she’s prompt at getting back to your emails, she’s knowledgeable about the marriage license progress, etc. I could go on, but my husband and I were so happy with our experience with her. We received compliments on our ceremony all night on our wedding night. Thank you for everything, Renee! !